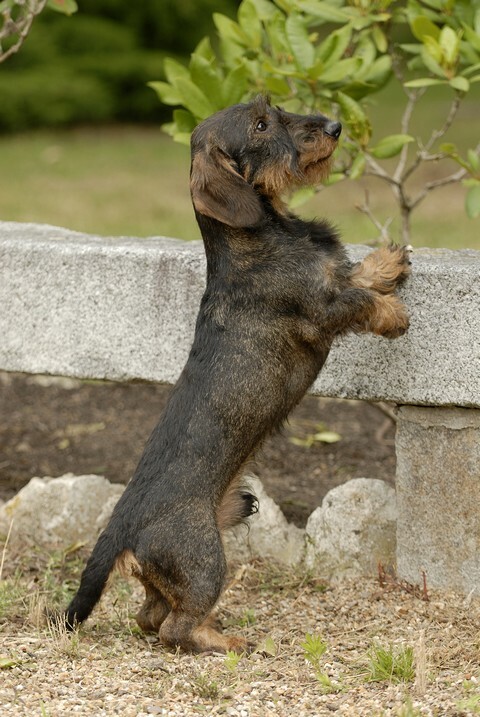 Doggy tales: une histoire de truffes. When I arrived home from school with a gang of six children for lunch last week under a glaring springtime sun, they all inexplicably dispersed in the garden like cockroaches discovering the storeroom of a chinese restaurant, and started digging around under the bushes. Just as I was wondering whether hunter-gatherers had been on the school programme that morning, my daughter ran back to me. « Mum ! Mum ! » she squealed into my face. « There are two little dogs here, they’re trooooooop mignon, can we adopt them ? » She beamed at me, flushed with the delight of finding two new furry friends right outside her own front door. On closer investigation, I found two wiry-coated dachshunds, tongues lolling sideways out of their mouths. Admittedly, they were very cute, with their floppy ears and their stubby legs. One had been intelligent enough to find safe refuge underneath the neighbour’s tractor, whilst the other was quaking under a pile of empty fruit crates. Both looked exhausted and in need of calm and water. I shepherded the children inside the house, bleating their arguments for two more four-legged friends in our abode, then successfully captured canine candidate number one. “Théo”, shaking and exhausted, happily licked me under the chin and held still until I’d dialled the number on his collar. His relieved owner lived a few streets away, and she explained that they must have run away whilst her husband was hunting for truffles. If I’d ever had any doubts, I now had confirmation that I was indeed in the South of France. After Macgyver-style sliding on my stomach through pungent thyme and grass to retrieve Théo’s dad from his lair underneath the tractor, I put the two prison-breakers in the car and set off to return them home. As I was greeted by madame, a Citroën van halted suddenly beside me. Its driver stalled and leapt out of the driver’s seat, leaving his vehicule in the middle of the road with the door wide open. He ran across the road, took my hand, and pumped my arm up and down with enthusiasm. After thanking me profusely for bringing his dogs home, he released my hand from his firm grip and examined my face, his eyes scanning mine. « I’m sure you’ve already helped me with my dogs once ». Confused, I dug around in the huge sweet jar I fondly refer to as my memory, and had a flashback to July last year, when I had stopped my car on a busy road to grab a puppy that had run across the road in front of a gravel truck. The puppy was indeed Théo, who was still faithfully following his adventurous genitor across the village a year later. « I was sure it was you. I remember your accent. English? » Dammit, Janet. Given away by your accent once again, Miss Jelly. I made a mental note that if I ever planned a hold-up locally, I’d have to remember to keep my trap shut if I hoped to remain anonymous. Théo and Sam were a father and son truffle-hunting duo, and they would make a bid for freedom whenever the door or gate was open. Their owner insisted on giving me something, to thank me. He was a bit nonplussed when I said that he just had to bring my dog back if he ever found it in front of his door. Ah. Technical problem. 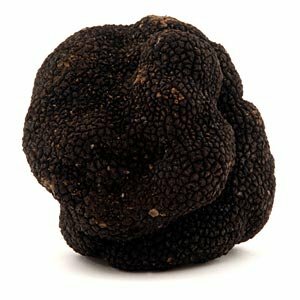 I had seen truffles at the market. Wrinkled and dark, like fresh, compact, fuzzy earth brains for zombies. They were kept in jealously garded boxes whilst their price was negociated in hushed whispers. But I have never tasted any, and told him so. A flash of satisfaction crossed his face. « Eh beng, voilà! I’ll bring you some truffles round the next time I go truffle hunting and I’ll tell you how to prepare them. You have to make une belle-euh omelette-euh ». On his return home, P.F looked at me incredulously, and shook his head. « Only you can manage that », he said, and smiled. “I’m looking forward to that omelette: make sure you don’t mess it up, l’anglaise”. This entry was posted in Family, Kids & Collateral damage., Me & the French: the great divide. and tagged humour, Living in France, South of France, truffles by Multifarious meanderings. Bookmark the permalink. PF could always make the omelette if he’s so worried… Caught by your accent, lol! Apparently there’s a real ceremonial to preparing tuffles. My neighbour is mightily impressed, and has told me that I have to ask for training before I even approach the things with a knife….. Big French ceremonial test in sight, methinks….